We totally renovated the entire condo. 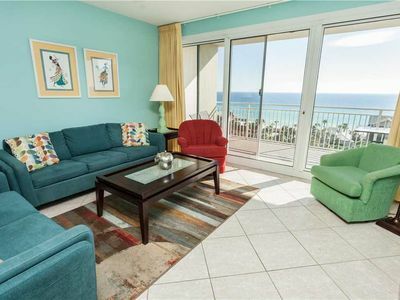 There is no other condo in Coral Reef with this same floor plan. We stripped it down to the studs, moved walls, and replaced everything in this condo. You’ll be able to see that we spared no expenses! We optimized all the space by altering the floor plan: we changed the configuration of the kitchen, moved the bathroom walls and added pocket doors wherever possible. 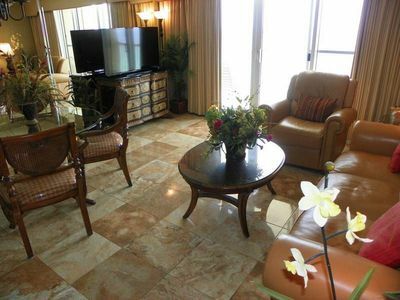 This is the only one bedroom condo in Coral Reef Club that has two FULL bathrooms and a separate laundry room. 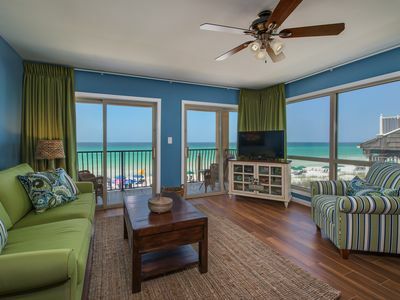 The first thing you will notice upon entering this condo is the amazing views! This is a corner unit which gives the benefit of TWO FULL walls of Windows! 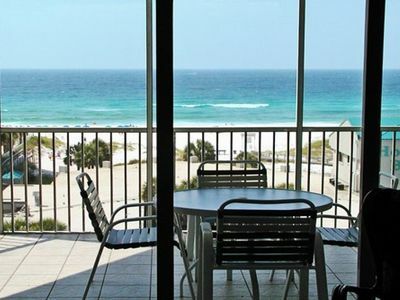 The views from our condo are breathtaking and expansive. Since the side windows face the west, you’ll also experience the beautiful sunset right from the living room. You will be pleasantly surprised by all the 'extras' in our home that you would not normally find in a rental unit. 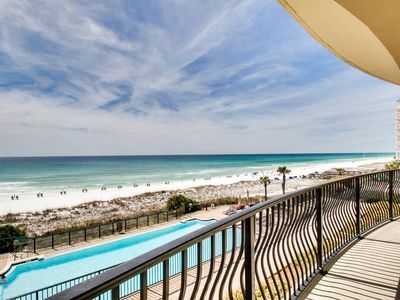 And of course, it goes without saying; you will love the white sand Destin beach that is just outside your door! 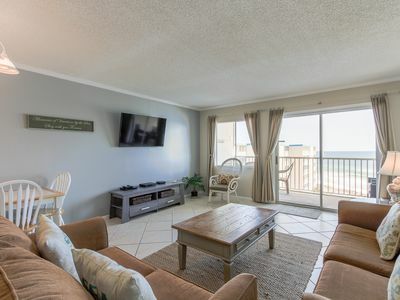 In our main living area we have two sliding glass doors with AMAZING beach views. Professionally Decorated, we have a very comfortable sofa and two side chairs with reading lamps nearby. The tables are made from reclaimed wood and our artwork is original commissioned art to perfectly set the mood. There is an HDTV with internet capability so you can use easily use your Nextflix or Hulu accounts to watch your favorite programs. We also have digital cable channels and an iPod docking station stereo. The balcony is likely where you’ll spend a fair amount of time so we made sure we comfy chairs to sit and enjoy your morning coffee, have an evening cocktail or just lounge all day watching the dolphins frolic in the water. Because this is an end unit you can easily see the beautiful sunsets to the west. Even if you don’t like to cook, you’ll discover your inner Emeril Lagasse or Julia Child in our dream kitchen. You’ll love cooking using our Calphalon Professional Cookware and convection oven. And even the most dreaded task—doing the dishes—is somewhat enjoyable using our extra-large apron sink. 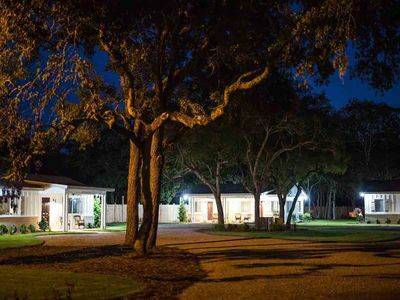 We, of course, have equipped the kitchen with all the necessities such as a dishwasher, toaster, microwave, ice-maker, blender, ample plates, glasses, wine and beer glasses and kitchen utensils. For your convenience, we supply many “extras” such as cleaning products, trash bags, aluminum foil, plastic wrap, sugar, creamer and spices. We even have filtered cold water from our French-door refrigerator. The Dining area features a small drop-leaf table with 4 dining chairs and the breakfast bar has 2 bar stools. And if you [unfortunately] have to work while away, we have provided an optimal work environment. 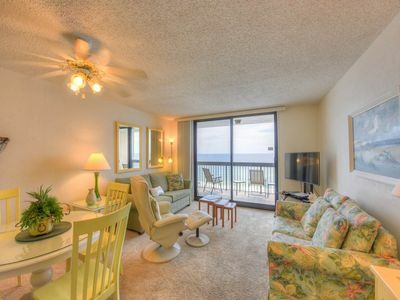 You’ll have the best view of the beach while sitting at our built-in desk. There is a dedicated cat-5 line internet connection to rapidly VPN into your work’s servers which minimizes the time you have to spend working. And of course, for all your i-thingys there is also dedicated wifi (the rest of Coral Reef is on a public wifi network). The Master suite is professionally decorated with original artwork and environmentally friendly reclaimed wood furnishings. You’ll sleep like never before in our King-size pillow-top bed dressed with Egyptian cotton sheets. The bedroom has 2 night stands, dresser, reading lamps, HDTV and original artwork. The attached Master bathroom has a luxurious tile shower, toilet, sink, hair dryer and large fluffy bath towels. For the children, we have built-in bunk beds in the hallway with built-in drawers. Each bed also has its own TV mounted to the end of the bed. There is a pocket door in the hallway so you can put the children to bed and not disturb them while you are still enjoying the living area, kitchen and bathroom. Please note: because these bunks are built-in they are shorter than normal bunks. Adults or adult-size children cannot fit in these beds and we do not have a sofa-sleeper (and sorry we do not like people sleeping on our sofa). The guest bath is off the hallway right near the children’s bunk area. It features a tub/shower combination, toilet, sink, hair dryer and large fluffy bath towels. 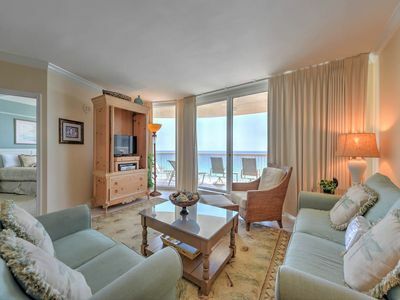 This is the only condo in Coral Reef that has a separate laundry area (it is NOT located in the bathroom). The laundry closet is located in the hallway and features a super-quiet, full-size, front loader washer and dryer. For your convenience, we also supply an iron and full-size ironing board. 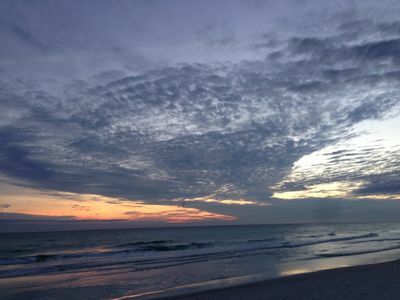 * FREE beach service--2 chairs and an umbrella set up each day for you! 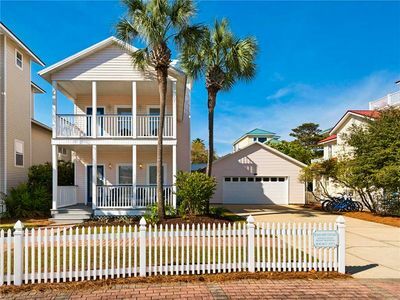 * Walking distance to restaurants and very close to local attractions, golf, restaurants, and shopping. We are very strict with our maximum occupancy on this condo. 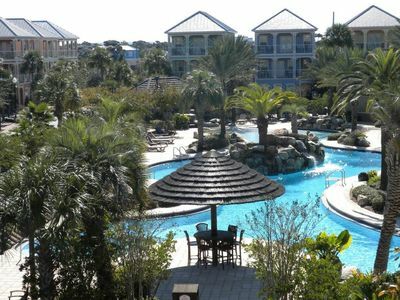 This condo is best suited for just 2 adults or 1-2 adults with 2 small children. 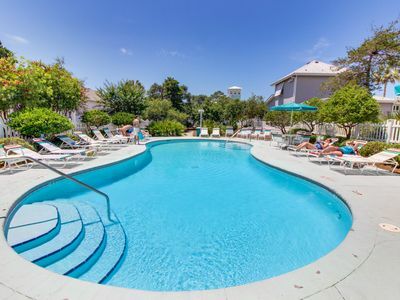 If you have more than 2 adults, it is highly advisable that you call or email us BEFORE you book this condo so we can make sure your family will fit comfortably. Be sure to check our calendars because they are always up-to-date, if this one is booked, we do have 2 others Coral Reef Club. You can view property ID # 476296, #705486. 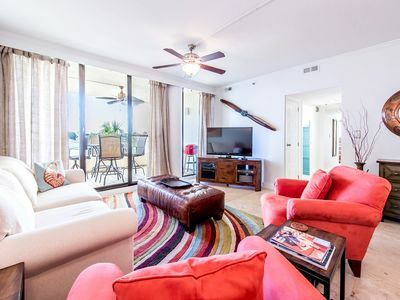 We also have one in Emerald Dunes, which is only 3 doors down from Coral Reef Club, see property ID #767733. 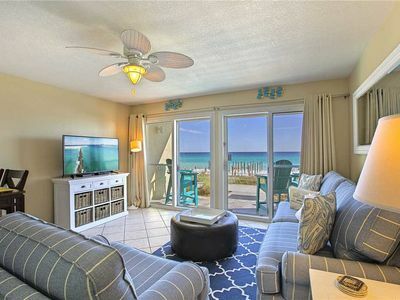 You can also check our other condos in the Destin area by pressing the “All My Rental Listings” right below the “Owner Info” section on this page. 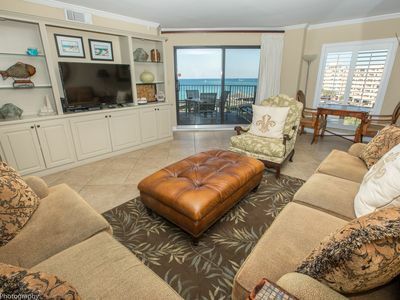 Feel free to book this condo instantly online or call or e-mail now for this lovely vacation rental. We’re generally very quick with to respond (within an hour). 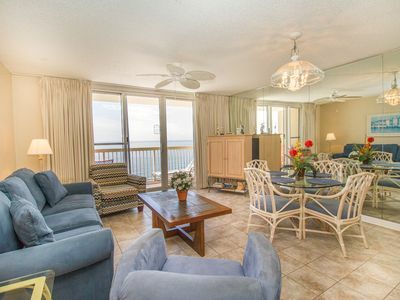 SunDestin 0807 - Book your spring getaway! Private Pool with Spill Over Spa! Newly Updated! Only Steps to Beach! 4 Complimentary Bikes!! Silver Shells M1106 - Don’t miss your spring vacation. Book now! Newly Renovated! 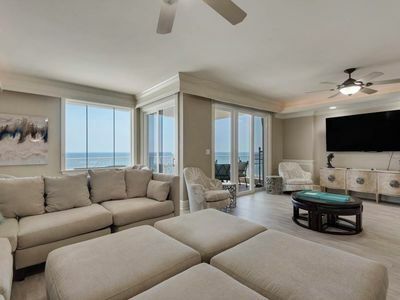 2nd Floor Luxury Gulf Front Unit! Community Pool! 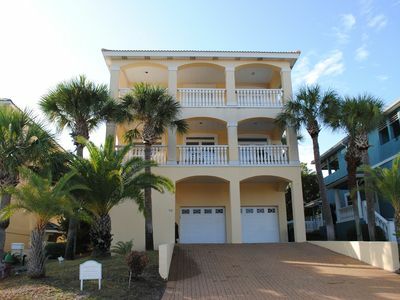 Sea La Vie: Luxury Home With 2 Master Suites. Cleaning included!